Anne Frank wanted to be a writer, maybe live in Paris....but life didn't go the way she wanted it to. Instead, her life went in a completely opposite direction. I cannot help feeling that perhaps her life was meant to be the way it was, so generations after her, would remember the war in such a way as to never want such a human tragedy to occur again. This is a version of the Broadway drama dealing with the Holocaust and perhaps that is why it is more upbeat. This movie is more entertaining than horrifying. While there is an undercurrent of fear and suspense throughout the whole movie, there is much left to the imagination. When Anne and her family are forced into hiding in Amsterdam, she is pensive at first, but soon learns that she can create her own happiness. There are two families living in a small space and they must face the possibility of being discovered at any time. They face hunger and cabin fever. They spend time reading, sewing, listening to the radio and being as quite as they can for most of the time. In the evenings when the workers in the factory below go home, they can then resume family life. Anne has not been exposed to the evils of life. 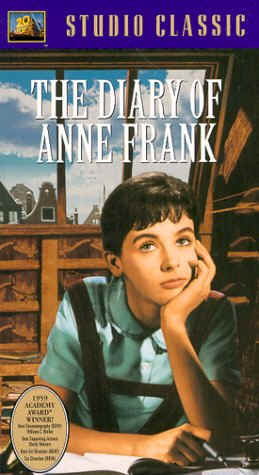 In 1942 she starts a journey to learn about herself and about the hardships of life. After receiving a diary as a present, she immediately starts to pen all her thoughts which are buried deep in her heart. As they spill out onto the pages, we are invited into Anne Frank's world. The world of a teenage girl, who is just learning about life, yet who learns so much in so little time. I found this movie to perhaps be the most emotionally engaging story I have ever watched on film. Anne Frank had my heart in the first ten minutes. I was in love with her character, her personality, her big bright eyes, her interesting way of looking at life, her thought process, her eternal optimism and her delightfully impetuous nature. You will simply forget you are watching a black-and-white film. The picture is so colored by the characters that in fact, you will forget you are watching a movie. It is quite amazing how a film could be made on two families living in a few rooms in an attic. For this to be possible and enjoyable, the story had to be so true, and so real, that it would demand your full attention. While this movie is based in the second World War, it is not at all pensive through the entire movie. I found myself laughing at one line so much, I actually cried. It was a line about the cat and I think you will think it is quite funny, especially if you watch the expression on the face of Ed Wynn as he is saying it. The cat belongs to Peter and becomes a part of the family. Having a cat in this movie was a delightful surprise. The playful taunting between Anne and Peter is amusing. Anne has no friends to talk to and can't believe she is trapped up in this room with no girlfriends to talk to. She is such a typical teenager, that you completely understand her frustration. While today we find it hard to comprehend how anyone could have their freedoms taken away from them, It could happen as easily to us as it did to them. Each time we treat someone with disrespect, we add to the evil influences in the world. It all starts in the heart. To me, Anne represented the good in the world, the light shining in the darkness. She had a heart which was so giving and she was open to experiencing life, no matter what her circumstances. Perhaps her soul was the most beautiful one God ever allowed to walk on our earth, and for such a short time. This is a movie you will never forget. Of all the movies I have seen, this one was the most beautiful in spirit.